Lync’s tagline is about connecting people in new ways. 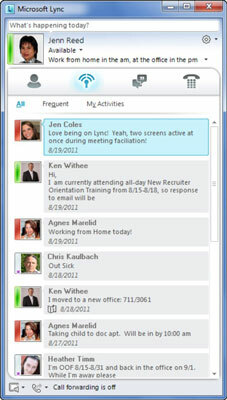 The activity feeds feature of Lync Online achieves this end and is important so that workers can have an ambient sense of who’s doing what, where, and when. Lync does a good job of rendering an enterprise version of Facebook’s newsfeed, but better than Facebook, is the automatic updates a contact’s feed will display if he changes office location or titles. As if that weren’t enough, Microsoft didn’t stop there. You know how you like the redial button on your phone? Lync’s Activity Feeds is the mother of all redials. In the feed, you can see a conversation history of all your phone or video calls, instant messages, and conferences. With one click, you can pick an activity — no matter how old — and resurrect it. Doing this helps provide context to communications, especially if you pick up a conversation that is over a few days old and may have been forgotten.